The Shroom Shop is a shop found in Princess Peach's Castle in Mario & Luigi: Partners in Time. Two Toads run this shop. Mario, Luigi, Baby Mario and Baby Luigi can buy Items, Bros. Items, Badges and Clothings here. More items are added to the inventory as the player progresses through the game, usually after every chapter. The Toad that sells items stays on the left side of the shop, while the Toad that sells Clothing and Badges stays on the right side of the shop. On the floor of the shop, a pattern of Mushrooms appear. 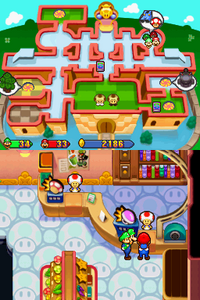 On the map, the shop appears in the top right corner with an icon of a Super Mushroom and pants. This is the first shop encountered in the game. There's a poster with Prince Peasley from Mario & Luigi: Superstar Saga on the back wall of the shop. This page was last edited on July 10, 2018, at 06:05.